"Счастливых вам праздников и наилучшие пожелания!" В это Рождество вся команда Smart-Clip желает вам счастья, любви и процветания в течение праздничного периода, а также, и в каждый другой день следующего 2016 года. Счастливых вам праздников и наилучшие пожелания, пусть следующий год будет ярким и успешным! В связи с запланированными техническими работами, сайт будет недоступен в воскресенье, 8-го февраля, с 04:00 CET до 06:00 CET. 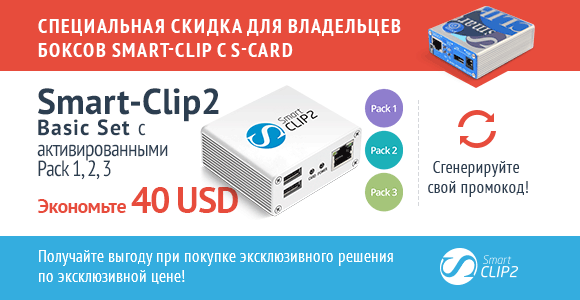 Экономьте 40 USD при покупке Smart-Clip2! Специальное предложение для владельцев программатора Smart-Clip c S-Card. Экономьте 40 USD при покупке Smart-Clip2 Basic Set с активированными Pack 1, 2, 3. Перейдите во вкладку " Smart-Clip USB Port (GSM)", закладка "Smart-Clip". Нажмите кнопку "Get Promo Code". После того, как промокод будет сгенерирован, скопируйте его в буфер обмена и вставьте в поле "SmartClip Promo Code" при оформлении заказа. Стоимость программатора Smart-Clip2 Basic Set с активированными Pack 1, 2, 3 будет пересчитана автоматически. Smart-Clip2 - проще, ближе, лучше! В далеком 2004 году на рынке появился Smart-Clip - продукт совместной работы команд Smart Clip и GsmServer.За 10 лет этот программатор стал одним из наиболее распространенных. Сложно представить сервисный центр без продуктов команды GsmServer, завоевавших надежную репутацию и доверие пользователей. Сегодня мы представляем новое поколение программатора - Smart-Clip2! Это устройство предлагает широкий ряд единственных на рынке сервисных решений, профессиональную поддержку самых популярных телефонов и полный набор сервисных опций. Новое поколение программаторов стало не только лучше, но и значительнопроще в применении. Оно буквально стало ближе к пользователю! Ведь у вас есть возможность "собрать" собственный Smart-Clip2, который будет соответствовать вашим потребностям: можно сразу приобрести полную версию продукта или начать с базовой с возможностью последовательной активации остального функционала. Обратите внимание, что на данный момент вы можете оформить предварительный заказ у менеджеров интернет магазина GsmServer. Отправки программаторов Smart-Clip2 начнутся с 8 мая. SmartMoto v4.32 and S-Card v3.13 are out! With this update we optimized the size of java-applet on smart-card. SmartMoto v4.31 and S-Card v3.12 are out! With this update we introduce new groundbreaking feature - remote unlock for Alcatel, Motorola and Vodafone phones! You don't need to connect the phone to PC anymore to unlock it! Added support for 240+ models. SmartMoto v4.30 and S-Card v3.11 are out! New models Motorola WX306 and WX308 are added to the list of supported. Due to some hardware limitations of S-Card starting from version 4.30 MTK module of Smart-Moto will be able to operate with supported MTK-based cellphones only. Full list of officially supported mobile devices can be found at the official Smart-Moto website. The following MTK models added to the list of supported. Many of these models released in 2012. Flash files for these and some other MTK models (more than 20 Gb) were uploaded to the support area. New version of ActiveX client v3.09 released. Support for new type of Java Cards - Gemalto GX-4 TOP IM has been added. You can update your Smart-Clip, S-Card and Smart Adaptor at Update zone of both Smart-Clip and GsmServer web sites. With this release we have resolved issues with Direct Unlock operation for models with "hardware lock". Smart-Clip rules have been updated. Please check them at our official forum. Please let us introduce a new version of SmartMoto v4.28. Fixed issues with cell phones based on NOR flash IC that were found in software versions since SmartMoto v4.26. We strongly recommend to update SmartMoto to this latest version. The terms of work with untested models are changed. Details are placed in this thread. In case you have untested MTK phone from this thread and you need to unlock it, please contact us for a tests. Motorola* EX118 / EX119 / EX223 / WX292 - First in the world! <>* Pay attention! These phone models have problems with network detection after flash/format FFS operations. Due to this reason it is required to backup calibration settings before flash / format ffs operations and to restore them afterwards! All feedbacks and backups received from our users were deeply analysed. Please use latest SmartMoto version for testing and backup reading from not tested in this thread MTK models. *Important information! Unlocking of these new models is currently in a test mode. If you have one of them, please follow this link for further information. Due to some FW versions inconsistency the freshly unlocked phone can request the code again after being rebooted. Users with WX345 that unlocked their phones via “direct unlock” option without saving backup and now have issues with network detect – please contact us for tests. Please remember that backup must be saved before performing Format FFS and writing flash to the other phone. Otherwise, the handset may have difficulties with network detect. This issue happens due to some firmware versions inconsistency. We will try to find a solution to it in near future. Improved “write backup” procedure for the NAND flash memory phones with 512 page size to the phone with page size 2048. Other words, from now, the backup file saved from the handset with page size 512 can be flashed to the phone with page size 2048. Added restore backup from one phone with NAND flash memory type into another. Implemented autodetection and bad blocks marking during the flashing process of the phones with NAND chip. Added complete handling of NAND bit errors. Single bit errors are corrected transparently. In case of uncorrectable bit errors presence in phone or it’s backup file, SmartMoto will inform you about it. Also, SmartMoto prevents flashing the backup file with uncorrectable bit errors. Released direct unlock and read codes options for Alcatel OT-355D. Added Direct unlock, Read/restore backup and flex for Motorola EX126 (beta testing mode). Added "Upgrade firmware" option for MTK-based phone models. This and other options are described in details here. Resolved the issue with phones based on Samsung NAND chip, ID [EC0076-5A003F], Flash size - 64MB, Page size – 512. Fixed issue with flashing option for the phones based on M18LR256B chip. We also significantly updated MTK flash files archive at Boot-Loader v2.0 portal. Please notice that "locked" and "tied to flash type" files are marked. Flash files are suitable for flashing with SmartMoto v4.23 or higher only. Modified detection of firmware version for MTK based models. Improved and accelerated flash structure analyzing process during reading the backup. Fixed Hardware IMEI reading for Alcatel OT-710 based on Chip M18LR256B. Now there shouldn't be any issues with this model based on specified above chip. Resolved the issue with Read codes and Direct unlock for some versions of Motorola WX160 and Alcatel OT-103. Now all hardware versions of specified above models are supported. These options are now available for both IMEI. Switch between primary and secondary IMEI using "work with secondary IMEI" option. Detailed IMEI repair and Read Codes manuals can be found at Support section of official Smart-Clip web site. P.S. Smartmoto v4.20 had a problem and no longer available. Those, who already installed it – please remove it from your PC. Flex files (*.wxfx format) contain default media files (іmages, ringtones), java applications and some phone settings. Flex file suppose to be restored after unlock procedure. Backup and Restore Flex procedures are fast and simple. Added support of Numonyx StrataFlash® Cellular Memory (M18). * These models are added in beta test mode. It’s strictly recommended to create phone’s backup before performing any operation. All firmware versions are supported. With our direct unlock solution, the cell phone won’t get locked again after reboot, unlike when unlocking with the server codes. * In cases if unlock code request is blocked by service provider (handset doesn't ask / doesn't accept unlock codes). ** In order to restore backup file, the option "Write full raw backup" should be checked in. Backup file can be restored to the phone it was read from, only. NOTE: For the Motorola EX-series models, backup files should be created with ‘Save FFS to backup’ option checked in. Procedure is simple and fast. No need internet connection or server credits to calculate codes. Support of Alcatel models based on MT6253 MCU (beta testing). "Phone MCU boost mode" option for OT-255 on Chip AMD-UNIFORM ID [1227E-22202200] is fixed. Note: Support of other Alcatel OT-8XX MTK-based phone models are added in beta test mode. In case you have the Motorola or Alcatel handsets based on MT6235/MT6253 MCU, please make a backup using LATEST SmartMoto version (v4.16) and send it to us by e-mail along with the log file. We will investigate them and add these models to the list of supported in further updates. World's first, fully safe direct unlock option for Motorola WX-series and MTK based Alcatel phone models. One-click solution - unlock process becomes much easier and faster. SmartMoto detects phone's hardware version and completes unlock process with the minimum user's intervention. World's first, IMEI repair option for Motorola and Alcatel models with auto SP-lock*. No more automatically SP-locked phones. Added Read backup option for the phones based on MT6235 MCU (Motorola EX112/115/128, Alcatel OT-800/802/808 etc). This option is implemented for research purposes. In case you have the phone based on this MCU, please make a backup and send it to us by e-mail. We will investigate it and add these models to the list of supported in further updates. * 'auto SP-lock' means that phone gets automatically locked back within few days after 'IMEI repair' operation. With this release this issue is solved. With this release we are glad to introduce fully reorganized and enhanced "Repair IMEI" solution for Motorola WX-series and MTK based Alcatel phone models. Repair IMEI procedure is simple and similar to "Read codes" instruction anounced earlier. Detailed manual is located here. Repair option. If you have software bricked phone, you can REPAIR it by flashing with *.mfw flash file. Note: Incorrect IMEI value (for example, in patched firmware) will produce wrong unlocking codes. (*) NOTE: It's strictly recommended to make backup copy before performing "Format FFS" or "Flash" procedures, because these options are added in beta-test mode. Read unlock codes, Format FFS, Flash, Backup/Restore options for Alcatel MissSixty phone model. Communication algorithm for the flashing and backup options of the MTK based phone models improved. Added support for 921600 bps. COM-port speed. (**) Locked flash files are marked with the word "locked" in the end of the file name. Interface improvements. Active unlock codes are now marked black, inactive are marked grey. Cell phone doesn't ask inactive unlock codes. Flashing procedure is simple and similar to WX series backup instruction announced earlier. Recommended versions of drivers for Prolific and FTDI virtual COM ports are here. NOTE: Backups, that were read from MTK based phone models with SmartMoto v4.07 or older has lower version and can not be restored with SmartMoto 4.08. Check out detailed Format FFS manual and alternative pinout for WX-series models. With this release we are glad to introduce the easiest and the safest unlock solution on the market. Released save backup feature for the specified above phone models. Please let us introduce a new version of SmartMoto v4.05. With this release unlock issue for EM35 model is resolved. Please pay attention to the following. It seems that one thing with ZN5 went out of control in SmartMoto v4.03. This version is no longer available. Those, who already installed it – please remove it from your PC. And now please let us introduce a new version of SmartMoto v4.04. As you understand, the ZN5 model issue is fixed. No more risk for any handset. This time we would like to ask all of you, did you have enough of killing MotoMAGX with other fake solution that pretend to be a professional one? We think, is right about time to stop it! So, please welcome – Smart-Clip v5.02, S-Card v3.03 and SmartMoto v4.03. First in the word, fully working, fully tested and absolutely safe – one button unlock and IMEI repair solution for MotoMAGX models. Please remember, this solution will never affect phone’s PDS and there is no risk for the phone! "Automatic Model Detection" option is released. * Please read the manual carefully before repairing specified above models. This update resolves the unlock issue for old P2K models (one button operation). Please let us introduce a SmartMoto v4.02. We know that some of you were surprised by the release of fake update from the bunch of people that pretend to be professionals… But we are not like them… We release fully working, fully protected and fully tested solutions. And as usual, we have good news for all of you. So, please enjoy - Smart-Clip v5.00, S-Card v3.01 and SmartMoto v4.01. The procedure is simple. If the phone is unlocked with SmartMoto just press keys 4 and 6, connect phone SmartMoto, log to IMEI repair tab and set repaired number with Write button. In other case - flash the phone with 2 flash files, connect to SmartMoto, log to IMEI repair tab and set repaired number with Write button. But we are here for you and we have good news! Please let us introduce a new version of Smart-Clip v5.00, S-Card v3.00 and SmartMoto v4.00. No TestPoints or server credits required. Just few easy steps. More details in the Unlock Manual. Please pay attention to the manual, as unlock procedure of MotoMAGX models differs from usual and requires SCout multiflasher software. The models W490 and W6 with boot version 0C.A1 are added to the SmartMoto list. Phone model W231 is proved to be supported and added to the list. Boot version 9.02 for the models V23* is supported by Prepare function. We are pleased to introduce a new version of SmartMoto v3.23. Introduced new stabilized algorithm for patching CDMA models. We are pleased to introduce a new version of SmartMoto v3.22 and S-Card v2.12. Supported new CDMA models: V750, VE20, VU30 and ZN4 (World's Exclusive!). Backup/Restore akey, ssd & prl for NAM2. We are pleased to introduce a new version of SmartMoto v3.21, Smart-Clip v4.09 and S-Card v2.11. A840, A860. These models are hybrid platform (CDMA-GSM). Released Restore IMEI option for them. First in the world. Unlock and Repair EEPROM solution for the model EM325 (Compal-Locosto unlock). W233, W397v are added to SmartMoto list (Compal-Locosto unlock). Detailed manual for the specified above CDMA models is located at SmartMoto section. We are pleased to introduce a new version of SmartMoto v3.20. World's exclusive, Unlock and Repair EEPROM solution for the model ZN200. Unlock and Repair EEPROM for W396. Improved unlock algorithm for W388. Now all versions are supported. We are pleased to introduce a new version of SmartMoto v3.19. We are pleased to introduce a new version of SmartMoto v3.18. Unlock and Repair EEPROM for the model W450 (Compal-Locosto unlock procedure). World's exclusive. Improved unlock algorithm for the phone model W388. We are pleased to present a special modification of our well known product. Smart-Clip Chinese Edition is designed especially for Chinese users and is compatible with SmartMoto Asian versions only. Its functionality, loyalty and warranty policies, support service etc. remain the same as those of the Smart-Clip "classical" variant. Smart-Clip CE is compatible with the same set of cables and accessories and supports the same range of models. Please, note that the Smart-Clip Chinese Edition can be used only on the territory of China. We are pleased to introduce a new version of SmartMoto v3.17. Full support (Unlock/Format FFS/Repair EEPROM) for the models W206 and W213 (Compal-Calypso unlock procedure). Unlock and Repair EEPROM solution for the phone model W388 (Compal-Locosto unlock procedure). Dear users, We are glad to inform you that phone model W177 has been tested and proved to be supported for unlock by SmartMoto. Unlock procedure is the same as for the model W175. We are pleased to introduce a new version of S-Card v2.10. The S-Card of the latest version 2.10 required to enable you to work with SCout flasher v1.12. Note: Details of SCout flasher v1.12 can be found here. We are pleased to introduce a new version of SmartMoto v3.16. Unlock solution for the model W360 (Compal unlock procedure). Released Repair EEPROM option for the following Compal models: W360, W161, W160 and W156. We are pleased to introduce a new version of SmartMoto v3.15, Smart-Clip v4.08, S-Card 2.09 and Smart Adaptor v1.05. Released Unlock, Format FFS and Repair EEPROM for the model W375В(Compal unlock procedure). The models W161 and W181 are added to the supported models list (although they were already supported before). Improved Prepare cycle for the models W510/W490. From now on, the handsets with an error 0085/00CA are supported. The model W270 was already supported for unlock, and now, Repair EEPROM and Format FFS are added for it. Developed Repair PDS function for the model U3. V365 fw R444HL1 is now included to the list of PDS Repair supported (although it was supported before). We are pleased to introduce a new version of ActiveX client. Smart-Clip and Smart Adapter update procedure is simplified. S-Card updater is moved to ActiveX client. So, no need to use S-Card update client anymore. Advanced settings are added to the ActiveX control. Smart-Clip with full cables set! We are pleased to announce that from now on Smart-Clip will be complemented with full cables set! We are pleased to introduce a new version of SmartMoto v3.14. World’s first, Unlock, Repair EEPROM and Format FFS solution for the model W230. Reorganized Format FFS procedure for W156/W160. Implemented some improvements to the functionality algorithm for Compal+ and Locosto models. From now on the Smart TestPoint v2.0 cable is included into the Smart-Clip set. We are pleased to introduce a new version of S-Card 2.08 and SmartMoto v3.13. World’s exclusive, Unlock solution for Motorola U3 (Prepare Smart TestPoint). World’s first, unlock of V3re, boot version 0C.F4 (Prepare Smart TestPoint). Repair PDS and Flash support for V3i with flash chip size 64Mb. Please note that new version of ActiveX client with manual select of the LPT port address is uploaded to Smart-Clip Update Zone. We are pleased to introduce a new version of Smart-Clip v4.07, S-Card 2.07 and SmartMoto v3.12. Unlock of Motorola W5 (Prepare Smart TestPoint). Released "Automatic Disable USB Printing Connection" while detecting the models W510, W490, W5 etc. The models W156 and W160 are added to the SmartMoto list (Unlock only). Reorganized "Repair EEPROM" function for some Compal models. We are pleased to introduce a new version of SmartMoto v3.11 and Smart Adaptor v1.04. With this release we present improvement in PDS repair process for the following models. For Smart Adaptor users Repair PDS option is available off line. We are pleased to introduce a new version of SmartMoto v3.10. With this release the list of supported Compal models is corrected. We are pleased to introduce a new version of SmartMoto v3.09 and Smart Adaptor v1.03. Unlock, world’s first Format FFS and world’s first Repair EEPROM for the models W175 and W180. The only unlock solution for W175 and W180 that doesn’t mess up the system and doesn’t require any drivers to be reinstalled or restored after unlock. Repair PDS for A1200, fw version R541. We are pleased to introduce a new version of Smart-Moto v3.08. With this release we present improvement of the IMEI repair process for the models A1200, E2 and E6. So, it becomes the only working solution on the market yet. NOTE. Those, who got "Invalid battery" issue after repairing IMEI on the models A1200, E2 and E6, to resolve it, please perform the following steps. Flash the phone with the same or the nearest higher version of *.pcf file using SCout flasher. Apply IMEI patch using SmartMoto v3.08, or higher version and restore the correct number. Flash the phone with boot file E6_boot_9.8.2.mfw using SmartMoto v3.08, or higher version. We are pleased to introduce a new version of Smart-Clip v4.06, S-Card v2.06 and Smart-Moto v3.07. With this release we present the flowing options. Resolved the issue (internal error 0009) with IMEI patching on the models C261, C275, V175, V177, W370, W377 and W375. Improved communication with Argon based models comparing to the previous SmartMoto version. Error 3C will not appear with this release. For better convenience, the Update process can be performed using either Update Mirror 1 or the Update Mirror 2. Please check the percentage scale and select the less loaded channel. We are pleased to introduce a new version of Smart-Clip v4.05, S-Card v2.05 and Smart-Moto v3.06. IMEI repair firmware patch via TestPoint for the models A1200, E2 and E6. Network IMEI patch for the models C261, W370 and W375. Also, for the models C275, V175 and W377 (requires to be tested with the network). Read info, using Smart-Clip connection, for the models A1200, E2 and E6 (E6 - firmware and language pack version only). We are pleased to introduce a new version of Smart-Clip v4.03 and S-Card v2.03. With this release Smart-Clip standalone "One Button" unlock process is fixed. We are pleased to introduce a new version of Smart-Clip v4.02, S-Card v2.02 and SmartMoto v3.05. With this release we present improvement in the process of restoring Temporary backup for the phone model V9 with boot version higher than 5.70. Warning. Starting from SmartMoto V3.04 the model Foma M702iG may not work with the old Smart TestPoint cable. In this case, please modify your cable to the version 2.0. We are pleased to introduce a new version of SmartMoto v3.04. World’s first, unlock K1s with boot version 0D.C0 (0D.C1 beta test). Smart TestPoint cable v2.0*. Unlock V9, boot version 5.80 (beta test). Released alternative Smart-Clip Update Zone at www.gsmserver.com. *Smart TestPoint cable v2.0. During unlock process the phone model K1s requires more stable signal to be sent from the Smart-Clip. Due to this Smart-Clip R&D team have developed a new version of Smart TestPoint cable v2.0. Those, who already have Smart TP cable, can perform a simple modification of their cable to the version 2.0 according to the modification schematic. Otherwise, the cable can be purchased at www.gsmserver.com. We are pleased to introduce the first update of the New Year 2008, a new version of SmartMoto v3.03. Repair EEPROM and Format FFS for W377 phone model. World’s first. Word’s exclusive IMEI repair solution for Sony Ericsson T250, Z250 and Z320. Please accept the greetings and best wishes for the New Year 2008. And now, we are pleased to introduce a new version of Smart-Clip v4.01, S-Card v2.01, Smart Adaptor v1.02 and SmartMoto v3.02. Offline* repair PDS option for USB Smart Adaptor owners. Released repair PDS option for the model V195, fw R3443U1 and L7, fw R44419. Unlock solution for W377 (beta test). New ActiveX client, supporting USB Smart Adaptor, is installed to www.boot-loader.com site. *Offline PDS repair is available for USB Smart Adaptor owners. Those, who don’t have a USB Smart Adaptor yet, can use Repair PDS option in the usual way with Internet connection. Detailed unlock procedure description for W377 is located in Unlock Manual. We are pleased to introduce a new version of SmartMoto v3.01. Released Unlock solution for Sony Ericsson Z320i and Z250i. Supported Unlock for V3хх with boot version 4.10 (beta test). Modified boot sending procedure for Compal W2xx series and F3. SE models are moved to the separate tab "SE phones" in SmartMoto interface. 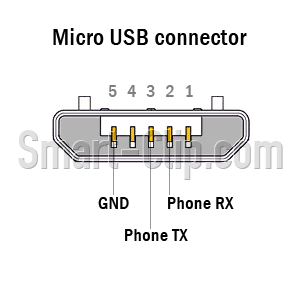 In case of having difficulties with connection of Sony Ericsson T250i, Z320i and Z250i please modify data cable according to the diagram with 2 low power Zener Diodes. The required Zener Diode value is 3.3V and 0.35-0.5W (for example, model 1N5988B). For more details please see cable schematic. You have unique opportunity to buy Combo Smart-Clip Set. Just for 329 USD you will receive well-known Smart-Clip with S-card + Smart Adaptor - device that was designed to connect Smart-Clip to USB port. Please, note: the offer is limited in time and valid through February 2008. Smart-Clip with S-Card can now be purchased for 299 USD only. We are pleased to introduce a new version of Smart Adaptor v1.01, S-Card v2.00, SmartMoto v3.00 and Smart-Clip v4.00. With this release we present. World’s First, Completely Free unlock solution for Sony Ericsson T250i. Tested on all versions. Foma M702IS with boot version 2.90 is added to the list of Smart TestPoint supported (beta test). Changed boot sending process for Compal W2xx series and F3. SmartMoto becomes compatible with Smart Adaptor. Connection method (USB or LPT) can be selected in the Smart-Clip tab. Added Persian language to the interface. The new ActiveX client is uploaded to the Update Zone at www.smart-clip.com (Supports Smart-Clip connection via LPT or Smart Adaptor). Detailed unlock procedure description for Sony Ericsson T250i is located in Unlock Manual. To attention of those whose handsets got harmed with SmartMoto v2.48. We are currently working on repair solution for them. Please wait for one of our next updates. Congratulations on the first S-Card anniversary! We are pleased to introduce a new version of S-Card v1.53 and SmartMoto v2.47. Unlock and Repair EEPROM for all versions of F3, including the latest boots. Stabilized and improved connection process for W2xx Compal models. Detailed description of F3 unlock process is located in Unlock Manual. We are pleased to introduce a new version of SmartMoto v2.46. Press Unlock button in SmartMoto. Press Power ON button on the phone. The rest of the procedure will be performed by SmartMoto automatically. More detailed Unlock manual can be found here. Also, released Format FFS (reset user code) and Repair EEPROM options for the specified above models. Added Persian language to the SmartMoto interface. Please remember that all Compal models require to be connected to PC using COM cable or USB cable with virtual COM port emulator. We are pleased to introduce a new version of SmartMoto v2.45. Detailed Unlock manual is located at unlock manual. We are pleased to introduce new versions of SmartMoto v2.44 and S-Card v1.52. With this update we present the following options. Developed unlock solution for the model W490 (Prepare Smart TestPoint). Released support for SE J110i and J120i with the new type of flesh chip. We are pleased to introduce new versions of S-Card v1.51 and SmartMoto v2.43. First in the world released unlock option for Foma M702iS (Prepare Smart TestPoint). Added unlock support for RAZR2 V9 (Prepare Smart TestPoint). Corrected direct unlock process for SE J110 and J120 and disabled read codes option. Released Read User Code option for Chi Mei based phones. Enabled option Reset User Code to default value for Chi Mei based models including SE J110 and J120. We are pleased to introduce a new version of SmartMoto v2.42. With this update we add the models with boot versions A.B3 and A.B4 to the range of supported by Prepare function (First in the world). We are pleased to introduce new versions of S-Card v1.50 and SmartMoto v2.41. World's exclusive, Enabled IMEI repair option for SE J110i and J120i phone models (SmartMoto, Chi Mei tab). We are pleased to introduce new version of SmartMoto v2.40. New boot versions of Argon based models are added to Smart Boot Detect system. So, from now on, the boots lower than 3.02 are supported. Model V3xx with boot version 2.Е3 is tested and approved to be supported by Prepare Smart TestPoint function. We are pleased to introduce new version of SmartMoto v2.39. With this update we are proud to present. In order to use REPAIR PDS option for listed above models Prepare Smart TestPoint is required. Smart TestPoint cable schematic and detailed Smart TestPoint process description can be found in Unlock manual at www.smart-clip.com. Also, Smart TestPoint cable is available for purchase at www.gsmserver.com. Please use only original accessories with Smart-Clip. We can not guaranty stable functions of Smart-Clip with the cables from other manufacturers. GSMserver team doesn’t bear any responsibility for the faults caused by cables from other manufacturer or for the faults caused by wrong usage of the original accessories. We are pleased to introduce new versions of S-Card v1.49 and SmartMoto v2.38. Added support of the new flash chip types on Argon series and for the model V3re. New boot versions are tested and approved to be supported by automatic Smart Boot Detect system of SmartMoto. Smart TestPoint cable schematic and detailed unlock process description can be found in Unlock manual at www.smart-clip.com. Also, Smart TestPoint cable is available for purchase at www.gsmserver.com. We recommend to use with Smart-Clip original accessories only. GSMserver team doesn’t bear any responsibility for the faults caused by cables from other manufacturers. We are pleased to introduce new versions of Smart-Clip v3.25, S-Card v1.48 and SmartMoto v2.37. First in the world, released Smart TestPoint unlock feature for V3re (V3_06). Enabled flash, save/restore backup and lang_pack opiton for V3re (V3_06). Added support of new types of flash chips and new versions of PDS zone. Smart TestPoint cable schematic and detailed unlock process description can be found in Unlock manual at www.smart-clip.com. Also, Smart TestPoint cable soon will be available for purchase at www.gsmserver.com. With this update we have corrected some steps of boot loading process for LTE2 ROM4 based models, connected in flash mode for Smart TestPoint prepare. We are pleased to introduce new versions of Smart-Clip v3.24, S-Card v1.47 and SmartMoto v2.35. With this update we present some changes applied the boot loading process of Argon based models. V3xx untypical* with boot version 03.08. *V3xx untypical includes some models with specific boot versions mostly provided by North American network providers (Cingular, AT&T etc). If the model V3xx can not be processed by Prepare cycle as a usual model, please select V3xx untypical and perform the process again. We are introducing a new version of SmartMoto v2.34. With this release we have improved detection and boot loading process for the models with boot version 06.12. We are pleased to introduce new versions of Smart-Clip v3.23, S-Card v1.46 and SmartMoto v2.33. First in the world released unlock solution for the model Foma M702iG. Added Repair PDS for the model L2. Improved and stabilized unlock process and save/restore backup option for Argon platform models. Foma M702iG requires to be connected using Smart TestPoint cable. Smart TestPoint cable schematic and detailed unlock process description can be found in Unlock manual at www.smart-clip.com. Also, Smart TestPoint cable soon will be available for purchase at www.gsmserver.com. We are pleased to introduce new versions of Smart-Clip v3.22, S-Card v1.45 and SmartMoto v2.32. With this update we enlarge the range of supported models by adding ARGON platform unlock and flash options. World’s first, unlock of V1100. Enabled save/restore backup option for the specified above models. Flash files and language packs for Argon are available at www.boot-loader.com. All Argon models require Smart TestPoint cable to be used while performing unlock process. Smart TestPoint cable schematic and detailed unlock process description can be found in Unlock manual at www.smart-clip.com. Also, Smart TestPoint cable soon will be available for purchase at www.gsmserver.com. We are pleased to introduce new versions of S-Card 1.44 and SmartMoto v2.31. Added model selection by series for Prepare cycle. L9 Prepare Smart TestPoint* procedure is perfected. * - Smart TestPoint cable schematic and detailed unlock process description can be found in Unlock manual at www.smart-clip.com. Also, Smart TestPoint cable soon will be available for purchase at www.gsmserver.com. Released new version of SmartMoto v2.30. With this release Prepare function for the models V360 and L7 with boot 09.02 is reorganized and corrected. Also, Prepare Smart TestPoint procedure is improved. We apologize for any inconvenience caused by the previous release. Released a new version of Smart-Clip v3.21 and S-Card v1.43. With this release Unlock button issue is fixed. We are pleased to introduce new versions of Smart-Clip v3.20, S-Card v1.42 and SmartMoto v2.29. World's first. Released unlock of LTE2 ROM4 models W510, L72 and L9, using Smart TestPoint* cable. No TestPoint Unlock for boot version 09.02, models V360 and L7 (Prepare Cycle). Smart TestPoint cable is a universal device and will be used for future updates, such as unlock of Argon based models. The solution for those models is currently under development. We are pleased to introduce new versions of SmartMoto v.2.28 and S-Card v.1.41. From now on S-Cards that were registered with Asian Smart-Clips are compatible with SCout flasher! We are pleased to introduce new versions of S-Card update client v1.04 and SCout updater v1.04. Connection between S-Card/SCout dongle and these new versions of update clients is improved and stabilized. Smart-Clip team presents you a second stage of SCout integration. If yesterday, the majority of Smart-Clip users thought that we forgot about them, then today we would like to prove the opposite. So, today, we are introducing SCard v1.40 and SmartMoto v2.27*. Most of you will ask: What are the advantages of that? Then let us give to all of you a wide explanation. SCout is a powerful multiflasher with access to flash files, fully functional support and upcoming updates. Advantage. Those, who need to perform flashing of big numbers of handsets and don’t require full Smar-Clip functions, can get a powerful multiflasher with free year of access to the biggest ever flash files collection at www.boot-loader.com at low cost (45 euro). SCard becomes compatible with SCout software. Advantage. All S-Card users get an opportunity to flash I-mode and Compal (Calypso+) models using SCout software. Flash files for them can be downloaded from SCout section at www.boot-loader.com All Smart-Clip users get access to that section right after update of their S-Cards to the latest version (v1.40). PC-Flash option is fully moved from SmartMoto to the SCout software*. Advantage. SmartMoto installation package is lowered in size. So, we have released the request of many users who were desperate to save the downloading traffic. SCout proves its name: SC out, functions without Smart-Clip, flashing directly via PC USB port. With this release we prove another time that our costumers are important for us and we consider their interests. * Note to Chinese users. Please be aware that Chinese version of SmartMoto currently stays the same (2.26) and still contains PC-Flash option. SCout compatibility for all Chinese S-Card users will be launched within few days. We apologize for any inconvenience caused by that delay. We are glad to inform you that V8 is tested and proved to be supported by PC flash features. Flash file for that model in *.pcf format is available at www.boot-loader.com. We are pleased to introduce new versions of S-Card v1.27 and SmartMoto v2.26. Corrected OTP status detection on V3x (AMD flash chip) and older models of C series (C450, C550 etc). Improved and stabilized flashing process for some versions of *.pcf files. We are glad to inform you, that the following models: K3, L9, L72, Z6, W510 are tested and proved to be supported for PC flash features. Flashes for them can be downloaded from www.boot-loader.com in *.pcf format. Some of the flashes might contain SP lock. So it is strictly required to reset Subsidy Code before flashing. We are pleased to introduce new versions of Smart-Clip v3.19, S-Card v1.26 and SmartMoto v2.25. World’s first, No TestPoint Unlock (Prepare cycle) for the models K1, L7e, L71 and Z3 with the following boot versions: 0A.B2, 0A.C0, 0A.C3. Boot version 0A.42 (models V3i, V3t, V3r & V3v) is added to support of Prepare function. IMEI repair patch for K1, Z3, L7e, L71*. View OTP status (locked/unlocked) option added. Improved Prepare Cycle procedure. If the Prepare is performed from the powered handset, all information about the phone is saved by SmartMoto, so it the information like: fw version, flex, operation band, etc, will be recorded in backup. Added Repair PDS for the model V3i, firmware version R4441D_G. Improved flashing of the model A1200, E2, E6 from boot mode with *.pcf file. * - please be aware that after performing repair IMEI for the models K1, Z3, L7e and L71 any future flashing will be possible by performing TestPoint connection only. Update Smart-Clip first and perform S-Card update after that only. We recommend to use only the latest versions of Smart-Clip, S-Card and SmartMoto. We are proud to announce the premiere of COMPLETELY NEW, WORLD’S FIRST, DIRECT, STANDALONE unlock solution for Motofone F3, developed by GSMserver team – F3 Unlock Clip. F3 Unlock Clip – is the easiest unlock solution, available on the market yet. It is operated by one button and requires to be powered from mains adapter or even 9V battery. Connect power to F3 Unlock Clip (9V battery can be used). Connect F3UC to the handset, powered on or switched into boot mode*. Press Unlock button on the clip. LED on the clip starts to blink frequently. Unlock process is in progress. On successful unlock, LED stops blinking and lights up for about 10 seconds. *To switch F3 into boot mode, please power off the phone and press 3 keys combination: *#Power On. The handset display will remain blank. If the LED on F3 Unlock Clip, after frequent blinking starts to blink slower instead of lighting up – the unlock process failed. Please disconnect the phone from the cable, remove and insert the battery, switch the phone to boot mode and perform unlock again. Limited stock of F3 Unlock Clips is available at www.gsmserver.com. Everybody’s welcome to place an order. We are pleased to introduce new versions of Smart-Clip v3.18, S-Card v1.25 and SmartMoto v2.24. With this version we release the following options. Unlock via TestPoint for E2, E6 and A1200 phone models. Unlock via Remove RSA option for V560 (boot ver. 8.26) model. Repair PDS option for A1200, E6 and V560 models. Please be informed that Unlock tutorials are now moved from SUPPORT section to SMARTMOTO USER’S MANUAL. For more details, please visit Smart-Clip official web site. We are pleased to introduce new versions of Smart-Clip v3.17, S-Card v1.24 and SmartMoto v2.23. Fully tested and fully working solution IMEI repairing for the following models: C975, C980, V980, V3x, E1070, E770, V1070, V1075 and V1150. This solution doesn’t affect any part of the handset firmware, also repairs incorrect patching performed with other tools. First in the world, unlock WITHOUT FLASHING for E1070 fw …F11P. Just apply Unlock patch. IMEI repair solution via patch for: W220, C168, C168i. Improved PREPARE cycle for the higher firmware versions of E1, L2, L6 etc. Tested and approved Repair PDS for the models C650, V220… fw versions R366. Those versions are supported. No additional operations have to be made. From now on, there is a possibility of changing the firmware version on such models as C975, fw ...91i and E1070 fw ...F11P. As soon as the handset is flashed with the different flash file version, apply IMEI repair patch and restore original number. We are pleased to introduce new versions of SmartMoto v2.22. Enabled Repair PDS for V3i, fw R3443H3. Stabilized Unlock procedure and resolved "sending boot" issue for some Compal and Chi Mei models. Improved version detection for Z3 and K1 in PC flash mode. Allowed flashing from boot mode in PC flash. We are pleased to introduce new versions of Smart-Clip v3.16, S-Card v1.17 and SmartMoto v2.21. With this update we release some REVOLUTIONAL solutions. No flexing or any additional action is required. No limitation. All versions are supported. Simply press UNLOCK button in SmartMoto. "One button" unlock for Sony Ericsson J100. Full_flash and lang_pack files for those models will be uploaded to SMARTMOTO section of www.boot-loader.com within few days. Please wait for our announcements. For detailed unlock instructions and cable pinouts of the added models please visit our support section. We are pleased to introduce new versions of Smart-Clip v3.15, S-Card v1.16 and SmartMoto v2.20. With this release the REPAIR IMEI option is enabled without connecting to the Internet. So, Smart-Clip users can stay offline while repairing the handsets. We are pleased to introduce new versions of S-Card v1.15 and SmartMoto v2.19. Added unlock for MPx200 and MPx220 via code calculation. There is no need to calculate codes for those handsets. From now on, they can be simply unlocked by pressing "Unlock" button in Chi Mei tab of SmartMoto. Please visit the SUPPORT section at www.smart-clip.com to find a detailed description of unlock procedure for Chi Mei based models. We are pleased to introduce new versions of Smart-Clip v3.14, S-Card v1.14 and SmartMoto v2.18. With this release the following options are added. Unlock via code calculator for Chi Mei based models. Improved and simplified SmartMoto interface. We are pleased to introduce new versions of Smart-Clip v3.13, S-Card v1.13 and SmartMoto v2.17. Repair PDS for V3r firmware version R3443U2. Improved Smart-Clip test-mode and enabled information detection for the models V6maxx, V3xx and V1100. We've analysed the situation with S-Card www.boot-loader.com bonus and came up to the solution that every user of Smart-Clip and S-Card is entitled to the bonus even if the dongle was activated before. Users, that are going to buy dongle to use it with their old Smart-Clip, will get the bonus access * starting from the day of the first update with S-Card. Login to www.boot-loader.com with your username, password and updated Smart-Clip. * Free access to SMARTMOTO section will be based on STANDARD price plan and limited to 5 Gb of download traffic. In case if any price plan (STANDARD or PREMIUM) is already activated, the user will be granted with 6 months of access in accordance with the price plan that is currently activated. We are pleased to introduce new version of SmartMoto v2.16. Unlock via TestPoint for L7e. Improved "Read lang_pack" procedure for V3i and V3r (TestPoint connection). V3v, V3t model detection for unlock via PREPARE cycle. Added full set of drivers (including Motodrv plus USB Modem, required for PC flash) for the latest models and Application to manage handset drivers (_DrvInstaller) to SmartMoto install package. We are pleased to introduce new versions of Smart-Clip v3.12, S-Card v1.12 and SmartMoto v2.15. Model V1150 was fully tested and proved to be supported by PREPARE cycle with specified boot versions: 06.71, 06.81, 06.82, 06.83, 06.84. Added Repair PDS option and full_flash for V195 fw version R3517. Released possibility of repairing the handset with damaged flash chip by replacing it with the used unit taken from the same model. We are pleased to introduce new versions of Smart-Clip v3.11, S-Card v1.11 and SmartMoto v2.14. Developed first in the world and released free of charge for Smart-Clip users. Also, V3x with Intel and AMD flash chip and V3r boot A.3.0 fw version R4515_G_08.BD.B3R are added to support by PREPARE procedure. We are pleased to introduce new versions of Smart-Clip v3.10, S-Card v1.10 and SmartMoto v2.13. Resolved "Clip communication failed" issue for older models (V60, V66, etc…), while flashing with *.smf flash files. We are pleased to introduce new versions of Smart-Clip v3.09 and S-Card v1.09. C139 fw version 1.3.29 is tested and proved to be supported. For the users, that received "phone hacked" message while unlocking C11x models, please connect the handset to Smart-Clip and perform the unlock process again. We are pleased to introduce new versions of Smart-Clip v3.08, S-Card v1.08 and SmartMoto v2.12. Advanced solution, unlock and IMEI repair patch without TestPoint of E1 boot A.05 (Prepare Cycle). Unlock for C11x fw version 2.5.78.N (Indian release). Unlock for Indian release of C139 fw version 1.3.29 (beta test). We are pleased to introduce new versions of Smart-Clip v3.07, S-Card v1.07 and SmartMoto v2.11. In case if i-mode modem is set to COM port 100 or higher, the handset will not get detected by SmartMoto.